I said there would be photos today, I didn't say they would be good photos - I just now realized I had the settings on the camera wrong - sorry! 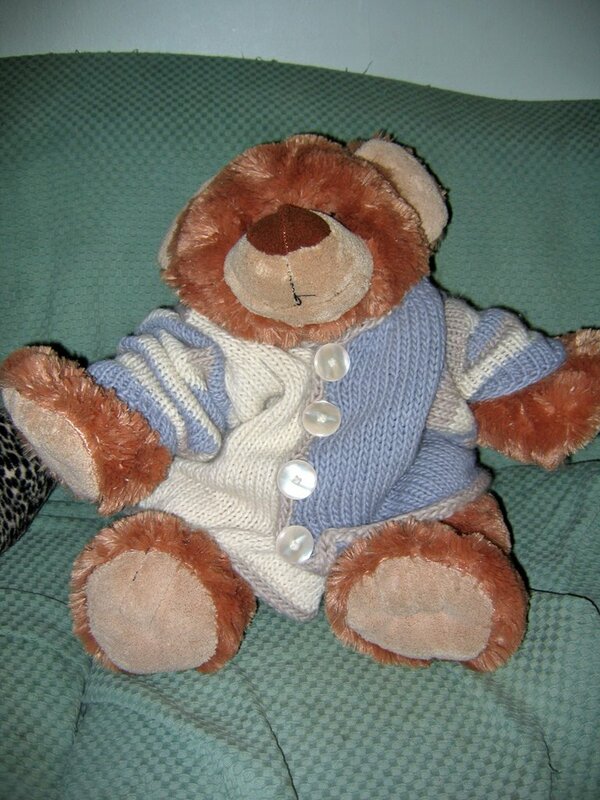 Anyway - once upon a time there was a fabulous supermodel named Barf Bear, BB for short. She starred in a knit-tastic blog and was beloved by all. She was setting up for a shot one day, when the camera took one photo and demanded more batteries. Of course there were no batteries to be had, so the photographer had to run out to the local purveyor to get some. 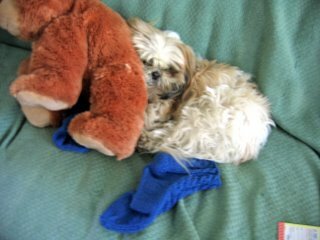 When the camera was ready to go again, lo and behold - BB and her four-legged best friend, Cinderella Puppy were no longer in the mood to pose... "Be gone human", said the puppy, "BB is MINE!" (In actual fact, the dog glared, yawned, and rolled over, but anything for a good story). And so the socks - (Cable Footies pattern in Rowan Calmer, for those who need to know these things) had to pose on their own. and more reading! Irish step dancing essay is here, courtesy of the Christian Science Monitor. I really like this piece (if I do say so myself) and was thrilled to sell it to the CSM. Photos for the next post, I promise! And a hat to go with! 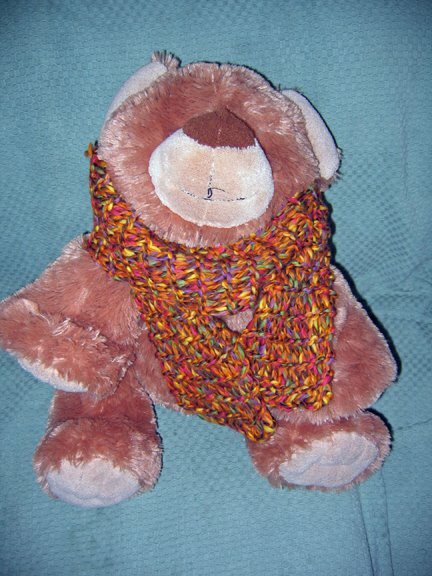 On the one hand, I love leftovers because it is like free yarn - just little bits of possibility laying around. On the other hand, the laying around part can ge to be a problem around here. So last night I was gathering up the leftover bits of the color block cardi, and decided that rather than put them away and have to think about what to do with them, it would be easier to just use them up - so BB has a hat to model today. No pattern - just cast on 48 sts and did a 2 x 2 rib on 10.5 US DPNs until I ran out of blue, then increased 2 stitches and switched to the cream in stockinette, and did my normal hat decrease on a multiple of 5. I ran out before I expected to, thus the oatmeal I cord at the top! But now there is just a little oatmeal left, the blue and the cream are off to warm a freezing four year old in Mongolia. Just noticed that ribbing looks kind of loosey goosey, but oh well. I had to stretch it a lot to get it on BB's fat head, hopefully it will look neater on an actual child! And as mentioned before, that yarn is so soft and warm, I don't think I will get complaints. When I went up to put the sweater in the Dulaan box, I noticed there were a lot less FOs in there than I thought. Then I remembered - some went to Indiana last year when they were looking for sweater and scarf sets for tornado victims, a small stack went to a shelter in Vermont at Christmas, and the blankets that had been in there went to Project Linus. So I better get a move on and add to the pile, I think we have to ship those in late June. Off the charity knitting trail, my mother has been hinting broadly that she wants some summer weight slippers. I made her a pair of merino Fuzzy Feet (from the Knitty.com pattern) and she looooooooves them. But you can't really wear wool in the summer, at least not in New Jersey. She doesn't hint for much, so I figured this was a command performance, but I couldn't figure out what pattern to use, or even what yarn since most of the cotton I had stashed was not so soft. Two skeins of Rowan Calmer to the rescue, in a deep cornflower blue. 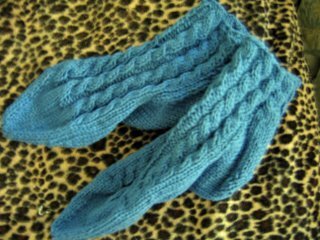 I went with the Cable Footie pattern from One Skein (my new favorite book of all time), and will add some Jiffy Grip soles to them when they are finished so Ma doesn't slip. They should be done soon, the kid has a dance competition tomorrow and if they are behind schedule as they so often are, that is some prime knitting time. Special wave to all of your driving by from the Harlot's blog - thanks for dropping in! Come back again soon. And a big thank you to Stephanie for calling me 'engaging' rather than 'a needy stalker'! Back to work on the never ending soap stone book, and a few more loggie sorts of things. This is a modification (isn't everything?) of the Color Block Cardigan from Leigh Radford's One Skein book. Made in Classic Elite Montera (50% llama, 50% wool) and headed for the Dulaan Project. 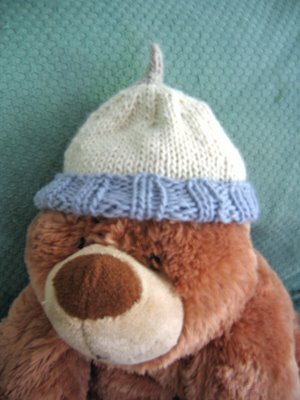 The original pattern has asymmetrical fronts. 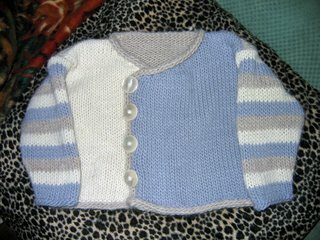 My theory is this - when you give someone you know a cute kids' sweater with asymmetrical styling it's a design choice; when you send a sweater to a stranger and the two fronts are not the same size, they could conceivably have a WTF moment. Along the lines of "Damn, no wonder that woman knits for strangers, she can't make two sweater fronts the same size and her family probably runs screaming." I also went with four buttons instead of two in the interest of warmth. 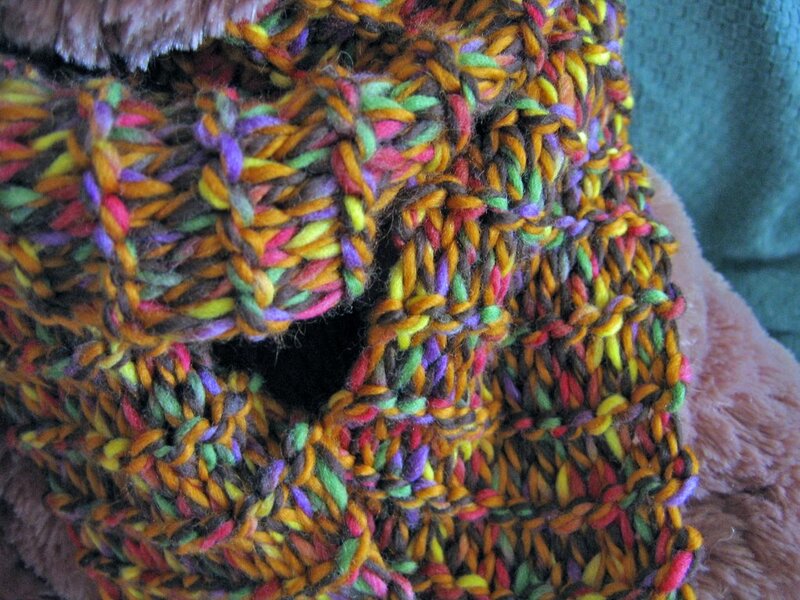 And I have to say this yarn is REALLY warm - and a little fuzzy, and very soft, and I just love it. Lookee what I finally learned to do - applied I-cord edging. Now I want to edge everything I knit with I-cord, just because I can. 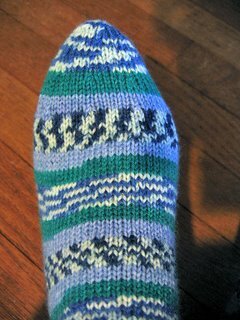 Which is a really bad idea if you knit socks as much as I do. The LYS that is shutting its doors is Handknits in Englewood, NJ. Not everything is on sale - most staple yarns she is taking with her to the next incarnation of her business, whatever that may be, but much of the store is on sale, with discounts running from 20% to 60%. They will close some time in late May, at least in theory. The Montera above was 60% off because there were only one or two skeins in each colorway, so this project made great use of it. The leftover bits will soon be a hat. And about the matching stripes on the Happy Socks - that normally doesn't work out for me, and it doesn't bother me because I am not obsessed with identical twin socks. The only thing I did do to kind of help it along was when the heel flap was finished, I cut out about two feet of solid green. 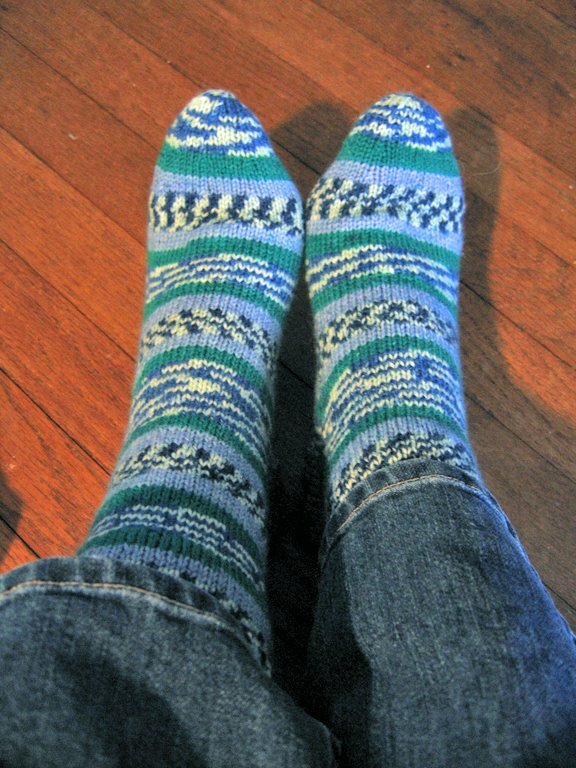 It would have looked odd for a skinny green stripe to just show up out of nowhere on one sock. No pics yet but I had to write about what a great time I had last night hearing the Yarn Harlot in her own voice. As nervous as she often admits to being in her blog posts, not a bit of that shows - she is a polished speaker, equally interesting whether telling stories you know are part of her usual speech, or doing an improvisation based on an event in her never-dull life. And she has a beautiful speaking voice, which I am an unholy snot about, having taught drama to high schoolers for so many years. No ums, no ahs, no high pitched nasal whining, I could listen to her read a cookbook. If you have a chance to see her, do it. You will laugh until tears roll dowm your face and into your knitting. I have to admit I was a big old geek right through the evening. The good news was I was in a whole room full of knitting geeks so I didn't feel bad. I wore the Clapotis which several people fondled, much to my delight. I knit the right front of the color block cardi for Dulaan while I was there (let's hear it for bulky weight stockinette for little people) and loaned Stephanie my straight needles and some yarn for an impromptu demo of her production knitting technique. Damn that woman is fast! Everyone waiting in line for signed books passed around my copy of One Skein - you think Interweave will give me a commission? And I met some wonderful folks, some I knew from cyberspace and didn't even know they were in the room! Hi Trek and Stacey! 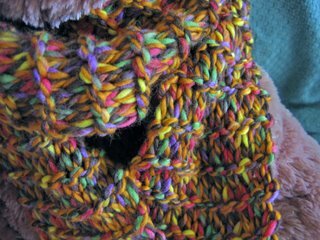 I am off to see the Yarn Harlot tonight and have been spending a way too geeky amount of time wondering what I should wear (as in which knitted socks, or maybe my Clapotis, or maybe both although that might be WAY too much knitwear, or maybe... you get the idea). I am also pondering what might be the perfect project to bring to knit. I want it to be brainless enough that I can focus on what she is saying, and of course I wouldn't be caught dead knitting that godforsaken fun fur puppy that the kid wants and I am halfway through in public! So - perfect excuse to cast on - I started the color block kid's sweater from One Skein. At the soon to be out of business LYS they had some odd skeins of Montera (50% llama, 50% wool) at 60% off and I grabbed them all up for the Dulaan pile. This color block thingy should work well, I can use a different skein for each of the main parts (it is a cardi, so back, right front and left front), use the leftovers to stripe the sleeves, and do the trim with whatever is left! 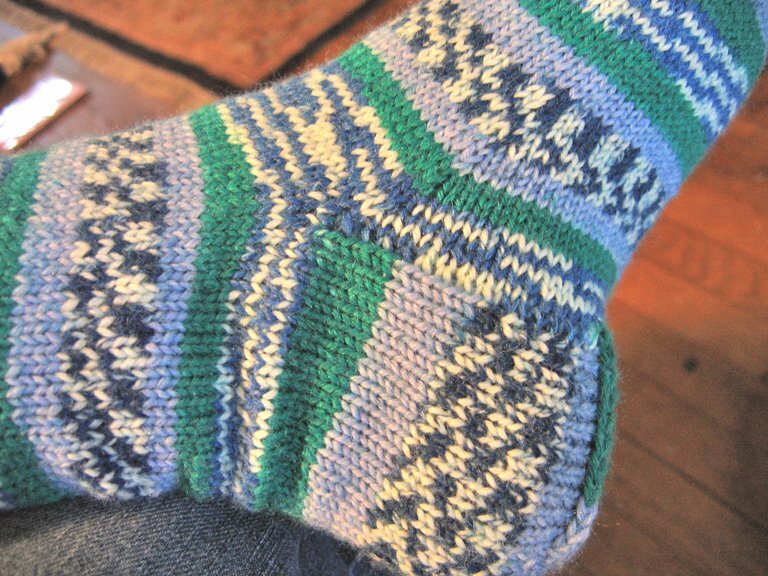 The Happy Socks are finished too! The just make me happy (speaking of geeky, yes, I know they are loud!). Yarn is Schoeller Stahl 6 ply Fortissima Colori/Socka Color in colorway 4010. They took every inch of two skeins for my size 9 feet. I didn't use a commercial pattern - I knew I wanted plain stockinette to show off the stripey goodness. 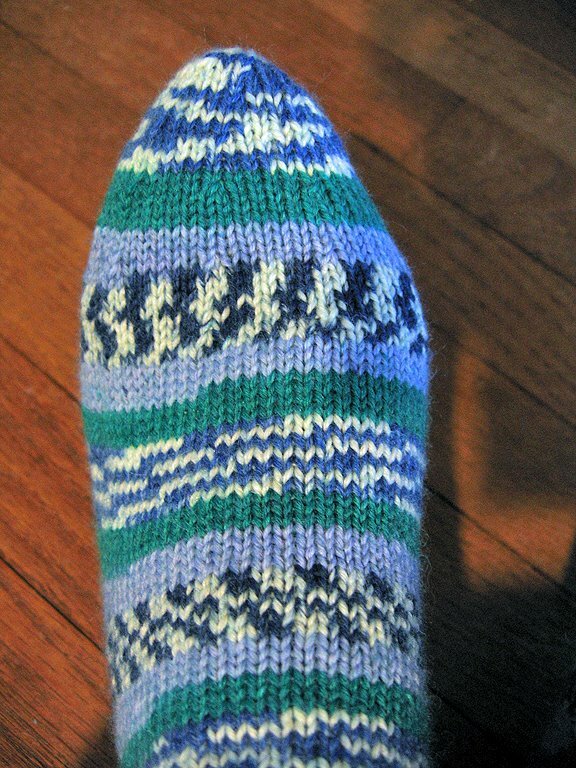 So I cast on 64 stitches on size ones, did ten rows of 2x2 ribbing, then used the Dutch Heel and the Round Toe from Nancy Bush's Vintage Socks book. I am not in love with the Dutch Heel, but wanted to try it, so there you go. I AM in love with the round toe, I find it to be very comfortable to wear, and it avoids the whole "I hate Kitchener stitch" thing at the end. G is also for Get Things Done, a book by David Allen that is going to organize my life. At least I hope it will. I read over it once, now I have to make some time to go back and actually put some of his systems in place. Hopefully next week when Spring Break is over and the kid is back in school. Back to work, the soapstone book is nearly finished (amen!) and I would be thrilled if I could put that manuscript in the mail on Friday on my way out of town to visit the parents. I sold an essay to the Christian Science Monitor and that makes me very happy because A) it is a good-sized, reputable publication and B) I would much rather be paid for being my own quirky self in an essay than write one more word about dead standing spruce for my log home clients (not that I don't love them too). Now you are rewarded with photos - a scarf for the Dulaan pile, just because I liked the yarn and found it on a sale table. 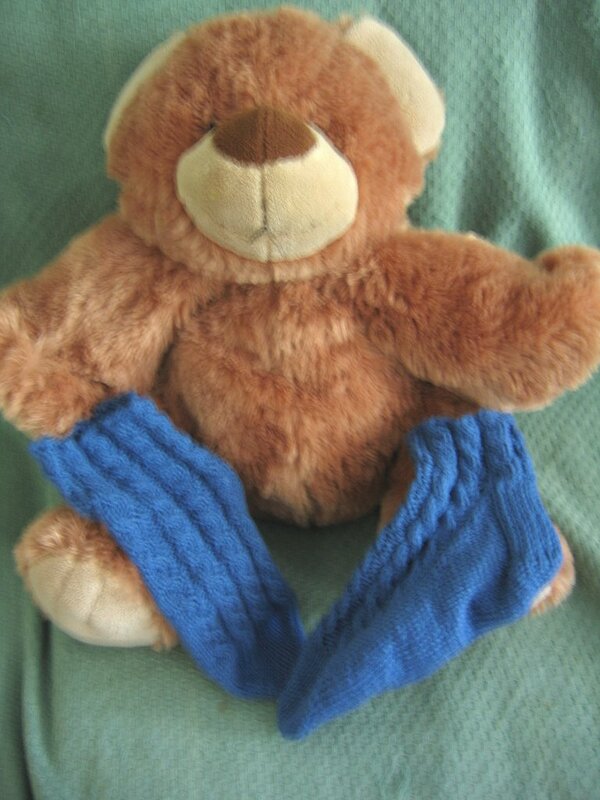 BB likes it too - but as you know, she just isn't that picky about knit wear! There is something immensely gratifying about a one hour knit. I got the yarn, got to play with it, and by the time I might have gotten bored with garter stitch it was all over. Speaking of yarn sales, I hit the Joan Vass sample sale in NYC because some clever woman on the Knitty Coffeeshop mentioned they were selling yarn as well as garment samples. I got a stash of tan and brown cotton/wool sock yarn, some red and black tweedy worsted, some pinky/peachy wool bulky, some red back and blobby wool bulky (prettier than that sounded!) and a good amount of Lane Borgosesia Hilton Print sock yarn. Two large shopping bags full of yarn for $60, working out to less that $1.50 a skein for really great stuff. It was a good day to be me! So there I was watching Grey's Anatomy, to which I am addicted, and I was all pleased to see Meredith and Izzie knitting. Izzie's character is pretty good, Meredith - not so much. Izzie makes a joke that she is knitting pieces of Meredith's sweater behind her back so she can switch them when Meredith is not looking because Meredith won't be able to live through one more bad thing in her life, and I thought that was pretty funny. Later on, when M is at the vet - the receptionist makes a remark that since she is knitting she must be off men. Huh? I mean, she is, in the show, but why is it that the woman assumes every woman who knits is supressing something? And then - Izzie gives the sweater to a patient she likes, admitting she has worn it for three hours so it would smell like her. Okay, it was bulky yarn and thick needles but she made a sweater for an adult male in one day while working full time, and had enough time left over to wear it for three hours? I am pretty fast, but what with the whole taking time out to save lives thing, I don't think I would have made it. 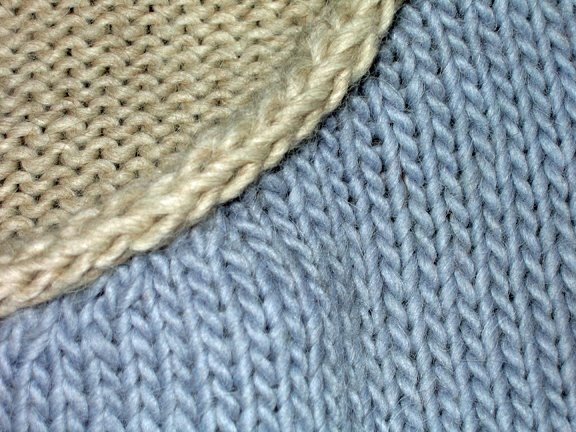 Why is knitting always wrong on tv? 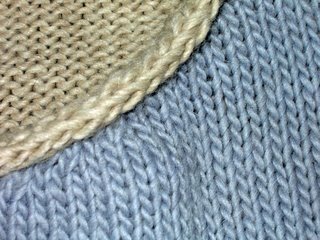 I worked in tv, I understand the time constraints, but is it possible that not a single prop person in the entire industry has a clear understanding on what knitwear looks like? I always see someone "knitting" when the finished project on their laps is clearly crocheted. They hold their needles wrong, hold the yarn funny, and stab at it like it is the monster in a horror movie. I have an idea for a new career - stunt knitter. 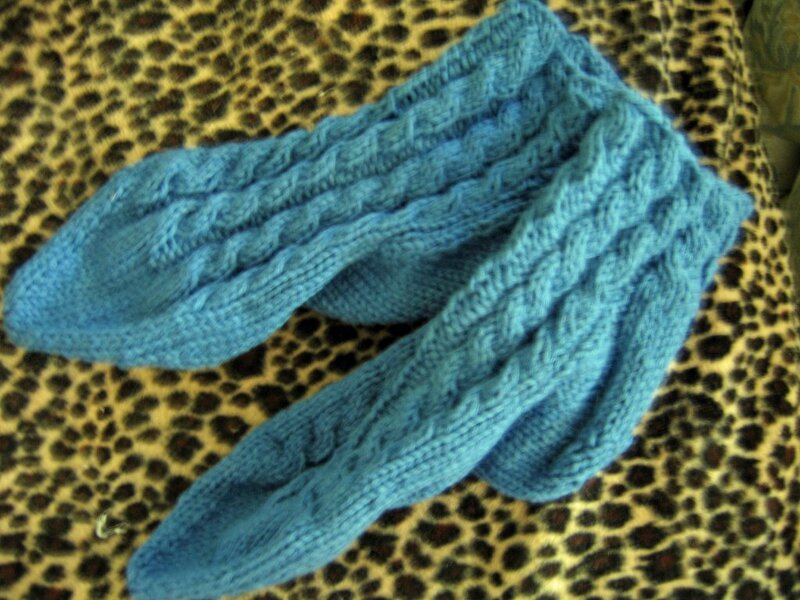 If they can cut to someone else's legs for a dance scene, or someone else's fingers for a piano playing scene, then I want to offer up my hands as stunt knitting hands. I wonder what union I would have to join?